Outsourcing for small to medium businesses is still in the early adopter stage and as a result a number of business owners don’t quite understand the type and variety of tasks a VA can perform for their business. In today’s session I cover a number of tasks our VA’s perform for clients and explain how you can get access to ‘748 Tasks You Can Outsource’ to give you an idea of the full scope of the tasks. As we speak this list is growing with the only limit to the tasks you can outsource being your imagination. 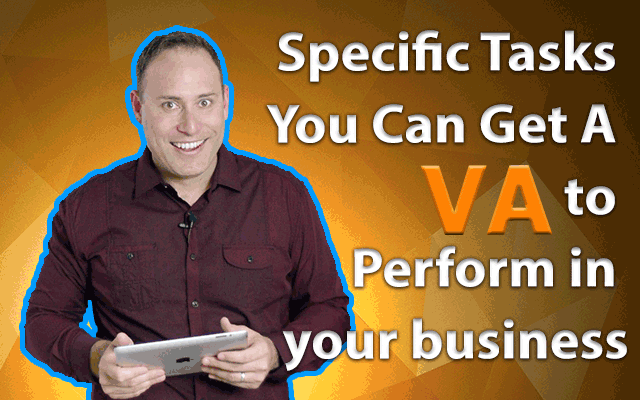 Hello and Welcome, David Judge here and today we’re going to talk about Specific Tasks you can get a VA to perform in your business. Make sure you listen till the end as I have a special report I have created called 743 tasks you can outsource that i’m going to give you FREE OF CHARGE!!!! So check that out at the end. Anyway, moving on… I have made a video about identifying the tasks you can outsource that you can check out ‘here’ where I give you a step by step process around identifying the tasks you perform in your business that you could outsource. Today, we’re going to delve in deep and show examples of tasks VA’s have performed for my business and for clients. So as we go through we’re talking actual hands on experience of how and what we’ve outsourced and I’ll also throw in a few little hints and tips along the way. There’s no doubt about it, the tasks you can outsource are huge and for a lot of businesses outsourcing is still in ‘Early Adopter’ stage, meaning local businesses that are using VA’s in their everyday business are really at the forefront of this space. What’s really interesting is these people are reaping the benefits, while their competitors are still feeling the pinch. As a result of being an early adopter I’ve found the idea of VA’s and what tasks they can perform is still a little cloudy. For 60% – 70% of businesses they would normally require a VA to act as a support in their business, performing a broad range of tasks that would free up their time to allow the business owner to focus on the profit generating stuff. This type of VA that performs the general tasks we call a ‘Universal VA’ as they can spread themselves across a broad range of tasks, becoming universally competent across a variety of disciplines (as it’s called). For the other 30% – 40% they require a specialized VA, that performs specific tasks that require a special skillset. This for example would be a Advanced Web Designer, Server Administrator, Drafts Person, Qualified Accountant, Video Editor, Graphic Designer and this is where you talk about a really specialised person that would hold a formal university degree in that discipline. There’s no doubt you could find a person that you can outsource these tasks to, yet it is important to be aware you would need a specialized person for each task. With that in mind we’re going to cover off the sort of tasks a Universal VA could perform and how that would look for a business owner. I’m going to break this into a few key areas and then give you a few samples of the style of tasks a VA can perform within each area. So, this is just a taste of what a Universal VA can do for you and in all honesty is a tip of the iceberg. What you should see is the tasks a UVA can perform for you are as diverse as your imagination and like i said this is really just a sample of the sort of tasks they do actually perform for clients. Each client has their individual wants and needs and as I said earlier 60% – 70% of VA’s can perform these general tasks as well as learn each clients SPECIAL TASKS. Ok, cool, now before we wrap up, I want to give you MORE. As I said this is just a small sample of the tasks they could perform and I want to give you what I like to call the ‘Motherload’ of tasks. I have a list of 743 tasks my VA’s have created based on the tasks they perform every single week. So you’re going to get access to REAL LIVE tasks they can run successfully to give you an idea of what works. To make it even clearer, I’ve also labelled each tasks as UVA for Universal VA and SVA for Specialized VA. I honestly have never seen this type of list anywhere especially from a person that has real hands on experience so you’re in for a treat. To get access to this list, goto DavidJudge.com and on the right hand you’ll see a link for you to get access. If you have any questions around the list of tasks I’d love to hear from you. Ok, let’s wrap up and talk about what we’ll cover next time. In our next session I’m going to discuss the qualifications your VA should have and how you can make sure they’re telling the truth. The second part ‘telling the truth’ is slightly touchy, but based on my experience we do need to address it.